Times are hard in the mountain city of Fellsmarch, and reformed thief Han Alister must rely on all his skills to provide for his mother and his sister. While out hunting one day, Han and his Clan friend, Dancer, discover three young wizards using a magical amulet to set fire to the sacred mountain of Hanalea. Han wrestles it from them, but without realising that his heroism has put him and his family in great danger. For the young arsonist is Micah Bayar, son of the High Wizard, and the amulet a treasure with immense power; it once belonged to the Demon King, the legendary wizard who nearly destroyed the world a millennium ago. The Bayars will stop at nothing to get it back. Meanwhile, Raisa ana’Marianna, Princess Heir of the Fells, has just returned to the city after spending three years with her father’s Clan in the mountains. She aspires to be like Hanalea, the legendary warrior-queen who vanquished the Demon King and saved the world, but her mother has other plans for her – plans that will put both the queendom and Raisa’s future in great danger. 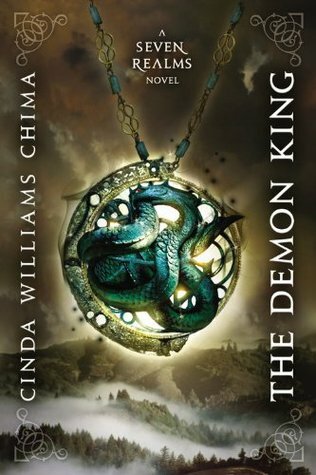 The Seven Realms will tremble when the adventures of Han and Raisa collide in this stunning new page-turner from bestselling author Cinda Williams Chima. Raisa is the princess heir and a wonderful person and also a feminist. Han is an ex-street lord who was adopted by the clans, and he makes money by delivering things to and from the clans in the Spirits. One day, Han and his friend Dancer run into Micah Bayar and Han acquires an amulet. This causes a whole lot of trouble, and Han’s family end up getting murdered by Gavan Bayar’s men (technically the Queen’s men, but whatever) and Gavan almost kills Han but he gets away and takes the amulet with him as he flees to the clans. Meanwhile, it’s almost Princess Raisa’s name day, so she’s almost of age. One day she decides to go to mingle among the general population because she’s heard terrible things. Amon Byrne accompanies her because he’s to be her personal guard. Raisa gets captured by Han, who doesn’t realise who she is, and then she frees a load of people from jail. Then, on her name day, her mother Queen Marianna tells her that she is to marry Micah Bayar right there and then. Raisa is like NO THANK YOU and escapes with the help of Amon, Captain Byrne, and her father, Lord Demonai. It turns out that Han is a descendant of the Demon King and his silver cuffs have been preventing him from using magic. Han agrees to go to Oden’s Ford to learn to control his magic. Micah Bayar and his friends come up into the Spirits, which they’re not allowed to do because they’re wizards and the Naeming says so. Han and Dancer come across them and Micah seems to recognise Dancer. Han tells them his name is Shiv, who is a streetlord down in Southbridge. They get rid of Micah, who starts a forest fire and accidentally leaves behind an amulet. Han picks it up and keeps it. Princess Raisa, the Queen, and Gavan Bayar (High Wizard) are waiting for Micah to hurry up so they can go hunting. Micah races back to them and tells them that there’s a fire coming. They flee, and Captain Byrne tells everyone to get in the river. Bayar uses the teenagers’ magic to put out the fire. Han goes to see Lucius, a grumpy blind man who owns a dog, and tells him about the amulet. Lucius tells him to keep hold of it and to hide it. Han returns to the city and gets attacked because people there still think he’s a street lord. The amulet protects him and blasts the Southies into the wall. Amon Byrne returns to the castle. He’s been away training to become a guard like his father, who is the captain. Raisa is very happy, but she realises that things aren’t like they used to be with her and Amon. She meets him in secret, accompanied by her nurse, Magret, who falls asleep so Raisa shows Amon her secret passage. And no, that’s not a euphenism, get your minds out of the gutter. They kiss in the tunnel for a bit and then Raisa accidentally offends Amon and reminds him that she is a royal. Han gets attacked by one of the guards, and Amon steps in to help out. He then tries to arrest Han but Han escapes. Amon told Raisa about how the common folk are suffering and that she has this ridiculous notion in her head that everyone is happy and doing fine. So Raisa gets Amon to take her to the Temple. He does so, but he brings some friends along to help out. Raisa is obviously unhappy about this. They get to the temple and meet with Jemson. Raisa gives him jewels and gifts to sell, which she was sent by her suitors. Raisa wants people to be fed and educated, and hopes that the money will help. Han shows up and Amon recognises him and confronts him. Han panics and takes Raisa as hostage, not knowing that she’s the princess heir and everything just got worse for him. Han takes Raisa to a secret hideout. She escapes when he falls asleep and runs into some Raggers. Han talks them out of hurting her, but Raisa overhears something about a bunch of Raggers being taken to the local jail and tortured for info. She sets out to free them. Han goes to find Amon and tells him about Raisa. Raisa pretends to be a Ragger called Sarie’s sister and gets taken into the jail. Together, the girls knock Mac Gillen out and take him hostage. Amon eventually arrives and lets them all out. They decide to keep this quiet from the Queen and Lord Bayar. Micah Bayar has his name day and they hold a party. Raisa takes off the ring that her grandmother, Elena, gives her, and wears a necklace given to her by Micah instead. This necklace is a seduction device, and Raisa soon starts falling all over Micah. Luckily, Amon and Averill Demonai arrive and Raisa is taken to her room. She is shut up there for a good while. Han goes to Marisa Pines again and he visits Lucius. Lucius believed he was dead and freaks out a bit, but it’s all okay in the end. He’s obviously worried about Han. Dancer and Bird have their name day. Bird becomes a warrior for the Demonai like she wanted, but Dancer isn’t so well off. It turns out that a wizard once came into the spirits and seduced Willo using a magical device. This resulted in a pregnancy, and Dancer was born. Dancer is a wizard, and he’s being sent to Oden’s Ford to train. Han returns home and finds out that his family are taking advantage of Princess Raisa’s charity and eating well. Han’s sister, Mari, catches the flu. Han goes to a trader and attempts to sell the Bayar amulet. The trader says he will try to find a buyer, and Han agrees to return in a couple of days. Han tries to get a healer to help Mari but the guy is a fraud, and Willo is away delivering a baby. Captain Byrne has a bad feeling about the Bayars and the safety of the royals in general, so he calls his son into a meeting. The Byrnes have been protecting the royal bloodline ever since Hanalea happened. It’s passed down from generation to generation, and what’s cool about it is that you CAN decline, and it’ll go to the next in line, and the next, and the next, and so on. Captain Byrne asks Amon if he wishes to take on the role, and Amon accepts. No backsies. Amon starts to hear people’s thoughts and intentions or something, and officially becomes Raisa’s protector. Captain Byrne and Averill Demonai go off to try to bargain for something or other. They say they’ll return for Raisa’s name day. It’s Raisa’s name day, and there is a party in her honour. She has to dance with a load of boys and men, and the last dance is with a guy called Liam, who tries to woo her. Han returns to the trader, who starts acting really shady. It turns out that he’s called Lord Bayar along. Bayar kills the trader, and tries to take Han to get the amulet, but Han is like NOPE and stabs the git in the gut. He runs home, and finds his “house” up in flames. His mother and sister have been burnt alive. Han recovers the amulet as well as his mother’s locket and a book of Mari’s, and sets off to Marisa Pines. Raisa is summoned by her mother, and it turns out that Marianna wants Raisa to marry Micah. This is forbidden, since Micah is a wizard, but Marianna isn’t listening because Lord Bayar is casting some sort of spell on her. Lord Bayar tells Micah to hex Raisa, and it fails because of Elena’s ring. Raisa pretends to calm down, and says that she wants to fetch something from her room before the wedding takes place there and then. Micah accompanies her but is not allowed in her room. Magret helps Raisa escape. Raisa runs into Amon. Amon and Raisa run into Averill and Captain Byrne while they’re escaping. The two fathers tell them to escape to Oden’s Ford and hide. They’ll stay behind and try to settle everything down. Han is called in to see the clans’ council. They tell him that Hanalea was pregnant with twins. The daughter’s line became the queens, and the son’s line were a bunch of wizards. Han is a descendent of the son, Alister. His cuffs have been preventing him from using magic. He agrees to help serve the clans after he learns to control his powers, so Elena breaks his cuffs and Han loses control, but Dancer helps calm him down. Dancer and Han are to go to Oden’s Ford to learn to control their magic. Cennestre – A clan term for mother. Elena’s title, as a matriarch. Naeming – The contract between the clans and the others. It ended the Breaking of the World.